While fellow young guns Fraser Dingwall and Ollie Sleightholme have grabbed the tries and headlines in recent weeks, Alex Moon has gone quietly about his work. The lofty lock, like his fellow Academy graduates, was given some big chances to impress by boss Chris Boyd. And there is no doubt that Moon grabbed his opportunities with both hands. With Courtney Lawes away with England, the 22-year-old stepped into some sizeable shoes. Moon made his first Premiership start against Wasps last month and went on to produce a commanding second-row showing. He was given the nod once again for the game at Sale Sharks on the following weekend and will get more game time in the Challenge Cup during the next couple of weeks. "I've loved every second of it," Moon said. "With Courtney away with the international stuff, I looked at my schedule and thought to myself 'let's try to push here and claim a slot'. That was my target. "I've managed to get quite a lot of minutes and I've started in the Prem for the first time. "I managed to get my family to the Sale game - it's just down the road from them - and I loved that. It was awesome. "Things have fallen into place to get some game time and it's been good. "I've been in the system with the club for three and a half years and I hoped I'd built up the confidence and knowledge of how we play. "I'd been leading the second-team guys against the first-team week in, week out, been on the bench previously and it gave me the confidence and knowledge to go out and play. It has undoubtedly helped Moon to be surrounded by familiar faces, with Saints finally giving chances to members of their successful Wanderers side. "It's awesome - I've been through all sorts with those boys," Moon said. "Three campaigns, a couple of (A League) title wins and I've shared some good times with them. "Playing alongside your mates is awesome; people like Ehren (Painter), Dingers (Dingwall) and James Grayson." And the highlight of Moon's fledgling career was certainly that Wasps game, when Saints took their Coventry-based club to the cleaners in a Gallagher Premiership win at a vibrant Franklin's Gardens. "It's one of the best games I've ever been involved in," said Moon, who has made nine first-team appearances for Saints, with all four of his starts coming this season. "It was a loud crowd at home, a dominant win and we just played really well. "Things just clicked for us. "We were trying things, they were coming off and things just fell into place that day. "We put in a great performance at home, which is what it's about." 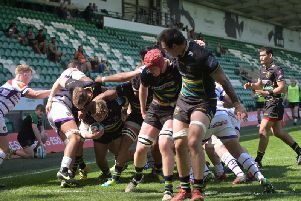 But Saints did not have such an enjoyable day last Saturday as they fell to a last-gasp 16-14 defeat against Newcastle Falcons. Moon was not involved in that match, but he had already sampled the pressure of life in the Premiership during the two weeks prior to it. And he says the demands of England's top tier - and the threat of relegation that so many sides feel this season - only serves to bring the best out of him. "I like playing under pressure," Ipswich-born Moon said. "I like having something on the line instead of it being a friendly game. "When you've got something on the line, you've got to perform. "It brings the best out of people and as a young lad you've just got to have confidence in yourself and not get too nervous. "There's obviously massive scope for you to become nervous, especially playing in the Premiership, knowing that a slight mistake can cost you points, but you've got to back your own ability. "The coaches have picked you for a reason so you've got to trust yourself." Moon has been receiving plenty of encouragement from the coaches this season. He explained: "They're just telling me to keep building week after week and not to drop off. "They're looking to pick on form so I've just got to keep trying to do what I have been doing and getting better every week." And now his sights are set on the Dragons in a Challenge Cup clash at the Gardens on Saturday. "We played well against Dragons and if we can get two wins over the next two weeks, we can be a close second to Clermont," Moon said. "We've got to really look at these two games, get two good performances in and use that to catapult ourselves into the Prem. "We need to get back to winning ways against Worcester and Exeter over the Christmas period."